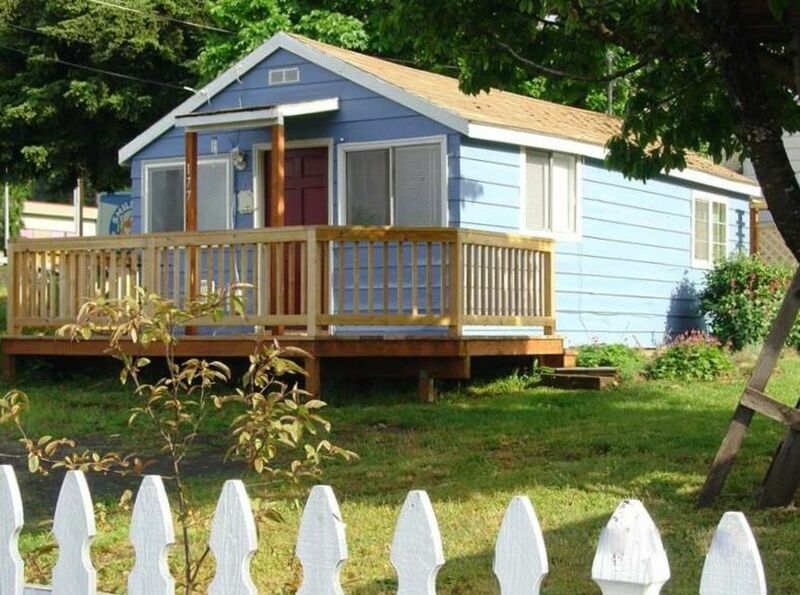 Charming one bedroom small cottage with Hood River Valley and Mt. Hood view in the heart of downtown White Salmon. 5 minute drive to Hood River. Walk to White Salmon downtown for coffee, restaurants and shopping. Enjoy the Mt. Hood views from the kitchen, dining area and the entertainment size deck. Deck also has peek-a-boo views of the Columbia river. Fully equipped kitchen. Hardwood floors throughout the house. One large bedroom with a queen bed and a futon in the living room. Perfect for a single, a couple or a small family with max two small children. NOT suitable for two couples or more than two adults. For windsurfers and kite sailors, we are 5 minutes drive to the Hatchery and 15 minutes to Doug's Beach without crossing the bridge. For kayakers and river enthusiasts, White Salmon river is a short 15 minute drive. Skiing and snowboarding is 45 minutes away to Mt. Hood Resorts. World class hiking and Mt. biking trails are minutes away as well as numerous wineries and art galleries. We are a family of 4 and love the Gorge. We love to windsurf, bike, hike, SUP, ski, climb or just hang out at the cottage with our two kids. We bought the property for us to use when we go down to the Gorge to windsurf. We like the location since it's close to our favorite windsurfing spots, the Hatchery and Doug's Beach. We also like the laid-back small town feel of White Salmon with a few good restaurants. It's quiet and private with a wonderful Mt. Hood view from the front of the house/deck. It's also very cozy and comfortable and has fully equipped kitchen. We love staying at our cottage, and our kids love the swing on the yard. There is a large cherry tree on the yard that produces a ton of cherries each year that our guests can eat and take. Fruit Trees, garden, swing for kids, large yard, park and city swimming pool a block away. Walk to town. This was the perfect place for me and my husband to enjoy a week in this beautiful area. Description of cottage is accurate as stated by owners. We stayed here for a month and were very comfortable. Air conditioning was adequate, all appliances worked well, unit was clean and in a fairly quiet neighbourhood. We are budget orientated renters and this unit suited our needs well. We would stay here again. I stayed here for a month while on a work contract in Hood River. It was a great home base for me. The bed was comfy, the kitchen was easy to make meals in, and the porch and view of Mt Hood were excellent. The internet wasn't quite what I needed for some work files, but is sufficient to browse the internet and stream music. I enjoyed being able to walk to restaurants in downtown White Salmon. I would stay here again! Warm and cozy with a spectacular view! Unfortunately our stay was cut short due to Eagle Creek fire. We enjoyed our short stay, however, the air conditioner was inadequate due to unusually hot weather. AC filter was extremely clogged. We cleaned it and then proceeded to purchase fan to use in bedroom. Owners were very understanding when we chose to leave early due to fire and smoke conditions. Also it was unclear in property description that TV was only available if you were a subscriber to a streaming service. We did find a excellent bakery within walking distance for our morning breakfasts! Cozy little space, we enjoyed our visit! We had a wonderful visit with grandma, cozy little cottage, and was fun to enjoy the small community pool just down the street too! Wineries, wild flower viewing, waterfalls, hot springs, year round skiing/snowboarding on nearby Mount Hood, scenic train ride, art galleries. * Dog fee is $5 per night per dog, not to exceed $50. ** We allow fill-ins (< 7 days) between week-long bookings during the peak season. Please contact us close to your arrival date with your inquiry even you do not meet the minimum stay. Nightly rate: $120 *** International/Canadian Credit Card Fee: additional 3% for VRBO or 4.4% for PayPal (Please let us know in advance. If forgot to mention at the time of reservation, we can deduct it from the deposit.) **** Cancellations: We ask that you give us at least 30-day notice to cancel your reservation for a full refund. If cancelled within 30 days of arrival, we will refund your deposit and all of the days we are able to re-book. Cancellation Fee: 5% of total amount.